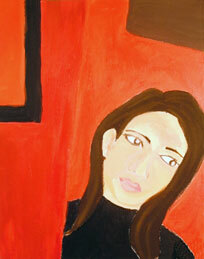 Alicia emailed me her looking glass photo that she used to paint her self-portrait in art class. I liked the composition, the deep reds and black, and the shadow under her nose in the mirror image. However, the left hand was in the wrong position. Emailed Alicia's looking glass photo to Chromatics for a slide conversion. At Chromatics, picked up slide of Alicia's looking glass photo for a possible painting. Started reading Robert Henri's Art Spirit. Read it before in the 60's. Traced Alicia in the looking glass slide using my Kodak slide projector. Wet thoroughly a 22x22" newspaper sheet. Spread eggshell latex paint on it. Practiced painting Alicia's two faces in wetness. Painted face, lips, and eyes and part of wall. Moved painting and paints back to corner of room so I could hold onto wall or table for support. Blended white, ochre, crimson with fingers and flow medium, but results not up to the quality of realism in oils—in fact, boringly academic. Washed some black over cheek. Fractaled the eyes by marblizing. Would like to do skin colors the same way. How? It's a watercolor technique. Do not know whom to copy for this effect except my old paintings which are not facially detailed. What would Cezanne do with Liquetex flow medium? Probably nothing. But it bled together colors in a way that reminded me of Cezanne with a wet brush not a dry brush. Subbed cobalt blue for black on cheek. At Richland library, browsed Cezanne, Monet, Renoir, and Degas portraits. Have always liked Degas best. 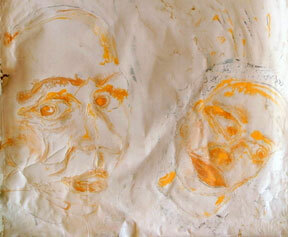 Continued allover flowing and detailing portrait. Put first wash on mirror image. Did only a little touching up of Alicia face. Added another layer to Alicia in mirror. Painted mirror lips. Continued with another layer of Alicia in mirror. Painted mirror eyes, first layer. Another layer on mirror face. Added blue shadows. Detailed ear and eyes. Painted the black sweater. Mouse called back from Idaho. Explained that portraits allowed me to show off and please others at the same time. Should I have been a stand up comic? Studio light bulb blew out. Bought a 150 watt fluorescent bulb at Ace for $14. Washed another layer on mirror face with crimson, ochre, white, and blue. Previously, on May 20th, Alicia gave me her self-portrait because the frame and canvas were damaged in the lower right corner. 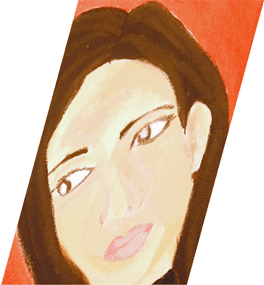 Made a skewed rectangular paper outline of Alicia's face in her self-portrait. Plan to cut out this face and paste it to wall next to mirror in my portrait of her. More washing of Alicia's mirror image. Browsed Velazquez book at library downtown. Alicia's Spanish features are evident in her photo and my portrait of her. However, the face looks even more like a young Boobette who, although part Cherokee, teaches Español with a Castilian accent. Concentrated on nose in mirror image. Painted and repainted right nostril. Mouse arrived around 3 pm. Mouse modeled her hand on mirror for the Looking Glass painting. Worked on shadow around and below nose. 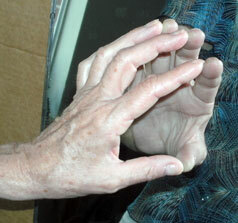 Again, Mouse modeled her hand on mirror for Looking Glass painting. Cut out hands in Photoshop for looking glass painting. Rode bikes to Cheekwood to see Chihuly glass works. Printed and outlined hand and mirror image for looking glass painting. Cut out Mouse's hand to go on Alicia's painting. Sketched it into painting with pencil. 1. Painted first tint of flesh colors on hand and image. 2. Painted more on hand and image. Painted more on portrait hands. 3. Hands beginning to look good now. 4. Minor touches on hands. The pastel hot pink on the joints corrects finger appearance. Repainted a fingernail on hand. Poured out a white acrylic rectangle layer on glass so as to print Picasso's Girl Before A Mirror. Plan to place it in upper left corner of Looking Glass painting. Printed a slightly skewed version of Picasso's Girl Before a Mirror. Painted another coat of digital gel on white surface. Painted a litle black around fingernails. Brushed another coat of digital gel on white surface. 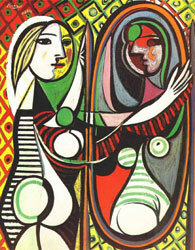 Printed Picasso's Girl Before a Mirror onto white digital acrylic. Sprayed it with fixative in hallway. Let it dry by window. 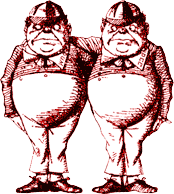 Looked at Tenniel's Alice drawings: http://www.johntenniel.com. Tried the Red Queen illustration in different places on painting in Photoshop. Cut out the Picasso Girl Before a Mirror to fit in upper left corner. Poured another white acrylic rectangle so as to print a reflected version Alicia's self-portrait. Spread another white coat on rectangle poured yesterday. Painted a little in upper part. Painted background various shades of red and black. Printed small reversed skewed image of Alicia's self-portrait. Sprayed it. Marked spots on Alicia's self-portrait where I will cut out the canvas. Mixed quin red, ut red, and alizarin. Repainted wall in portrait. Decided on putting Red Queen, Tweedles, and White Chess Knight in portrait. Played with Alicia's self-portrait in Photoshop. Added Chess Knight, Red Queen, and Tweedles. Apartment was bug sprayed and inspected while I blackened lower right of painting. Glazed cobalt and payne gray over red wall. Poured clear acrylic for printing Red Queen pulling Alice. The Tweedles and Knight plan to paint. Poured out clear acrylic for Tweedles and Knight. Scumbled flo red on red wall. Coated clear acrylic with digital ground for Red Queen printing. 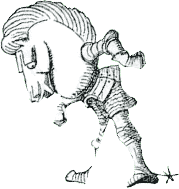 Painted Chess Knight with black lines. Painted Tweedles with red lines, but did not look good enough. Printed Red Queen and Alice. Then sprayed it. Peeled up Tweedles painted yesterday. Looked good enough. Painted more red onto Tweedles. Talked to Mouse while cutting out Red Queen. Outlined on a glass plate the mirror area in Alicia painting. Fooled around in Photoshop with Alicia's mirror background. Fire does not work; destroys the classical muted reds. Last time I worked on this painting was Dec 10th before LA trip. Need to go back to Al Pounders' cubist interior look. Scumbled the mirror area of Alicia painting. Played with the hair, partially scumbling and partially marblizing. More scumbling of mirror area. Rippled the turtle neck shirt with more mars black. Worked more on hair in mirror. Needs more work on hair out of mirror. Scraped off some top of the marbling on external hair. Scumbled a grayish red onto mirror background. Worked over same areas as yesterday. Noticed that hinge on a furniture thingy was straight not curved. Repainted it. Marbled top of hair. Overpainted dimmer mirror areas with dull red that matched photo. Continued to marble hair. Brushed white glass glazings on mirror. Tried out some perspective chess squares in Photoshop. Worked less than hour on portrait. Added more hair below hand in mirror. Added more streaks of black to hair. Touched up eyebrow. Overpainted light ray in mirror with cobalt blue. Poured more black onto black wall stripe. Tinted top of hair with sienna and cad wash. More hair streaks in mirror. Stripped Alicia's canvas from frame holding her self-portrait and cut out her face, which looks like Picasso painted it in his primitive African style ala his 1906 self-portrait. 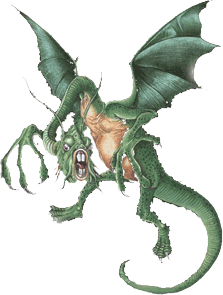 Decided to put the Jabberwock in the portrait on the shoulder. Tested different tapes for masking paint using the destroyed Alicia canvas. None prevented bleeding. Glazed dark area in mirror. Marbled top of hair on glass over top left of portrait. Painted edge of Picasso Girl Before a Mirror. Poured a square of clear to print Jabberwock. Returned eight AA Studio 18x24 canvases back to Plaza, some of which Max and Lisa gave me for last birthday. Swapped them for three 24x36 canvases. This is the size I have now become accustomed to painting on. Perhaps because the ratio of 3:2 is closer to the golden mean than 4:3. First, gesso the seam where tape meets canvas, and let dry. After drying, apply paint where wanted; it will not bleed under tape. Back home, using Alicia's scrap canvas, clear coated the seam where tape meets canvas. After drying, impastoed a thick black layer between the two masking tape strips. Masking tape technique worked! Left nice clean unbled edge. Taped off mirror frame and wall stripe. Coated seams with clear acrylic. When dry, coated black stripe and mirror frame with thick layer of Mars black. Pulled tape up. Mirror looks good, but one edge of black stripe peeled raggedly. Patched ragged edge with clear. Put a tape on its edge. Clear coated the seam. Made an extension of mirror frame with tape. Clear coated the seams. Printed purple skewed squares to test in upper mirror area. Pulled up tapes. Looked good. Painted check squares in upper right. Placed the Picasso Girl Before a Mirror. Streaked more on top of hair. Started to extend hair in lower left. Poured clear acrylic over Picasso print where hair top will go. Over painted squares in mirror with mix of crimson and payne gray. Laid stripe of tape on mirror where glare will go. Painted upper purple squares. 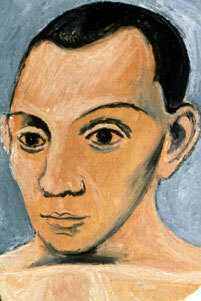 Streaked hair strands at top of head and over bottom of Picasso print. Hilited with white the mirror frame in the middle where the glare is. Glare on mirror frame bled through tape. Blacked out the bleeding. Streaked more hair strands over Picasso print. Placed reverse image of Alicia's self-portrait in upper right. Placed Red Queen decal pulling Alice into mirror. Placed the Tweedles decal over mirror image heart. Printed and sprayed the Jabberwock. Painted skewed upper checkered squares a lighter red purple. Then overpainted it a darker red. Put a glare in upper left on wall. Bounced more white beams off frame glare. 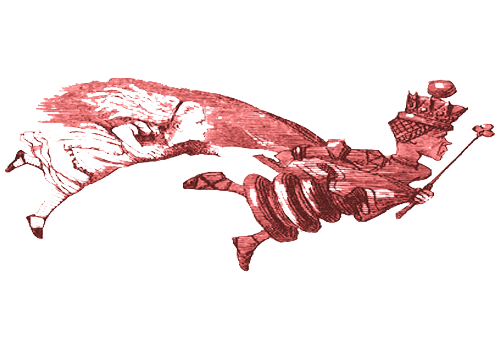 Cut out the Jabberwock decal. Painted face and claws on back of Jabberwock with yellow ochre to define it more. 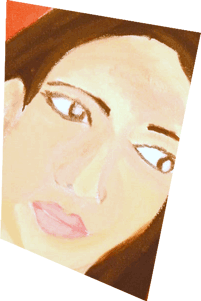 Painted upper corner of Alicia's self-portrait with orange to match printouts. Started 2 crimson-cobalt "glare" squares above and below Tweedles. Red Queen and Alice decal did not come out well. Will need to paint over it. Painted vest with burnt umber wash on back of Jabberwock. Painted more orange on upper corner of Alicia's self-portrait. 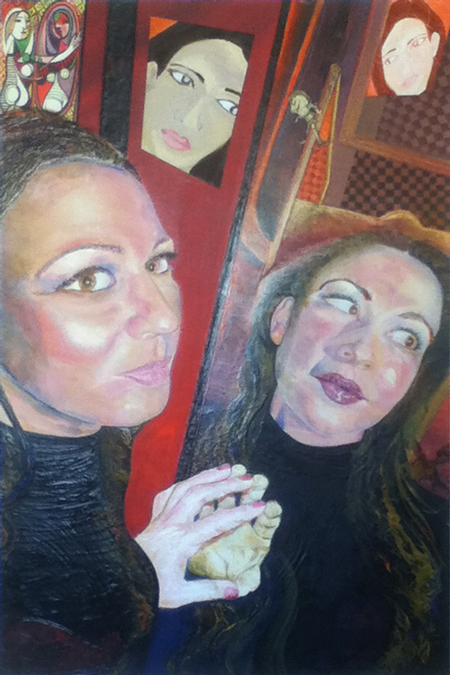 Brushed clear acrylic onto this self-portrait and placed it in upper center. Did not take a snapshot of painting today. Too dark outside. Painted over lines of Red Queen Pulling Alice with alizarin crimson. Glazed alizarin cobalt glare squares on turtle neck around Tweedles. Placed Jabberwock on shoulder of mirror image. Painted sides of canvas. Painted back of White Chess Knight an off-white ochre. Placed the White Chess Knight on chair leg. Painted more alizarin cobalt glare squares. Painted around face of Alice beign dragged by Red Queen. Repainted squares in upper right a more orangier brown. Muted the Tweedles with coat of black and then cobalt. Glazed a little more white on mirror frame. Made some orange rays reflecting slightly off mirror. Will rest this painting for a while to gain some distance before glazing faces. Not sure the color tones work yet, but what does that mean, anyway? This month, I began reading a book Mouse gave me by John Loori titled The Zen of Creativity. It describes the aesthetics of Zenga and Nanga, styles of zen painting which seem to be the ultimate goal of all artists since Jackson Pollock. The methods in my portraits, however, are obviously not in the Zenga style; but in many ways opposite, more like the methods of engineers and architects, which tend to destroy spontaneity. My methods plan ahead and plod along, not very zen-like at all. Spread white titanium to print Jabberwock poem on back of portrait. Added more comments to Looking Glass webpage. Sent an email to 24 folks listing my Looking Glass webpage. Backed up Alicia's laptop on my 8GB thumb drive. Found 2 photos that revealed the background in the mirror of the portrait. What I saw as a table upside down was actually a doorway, and a picture frame was actually the ceiling, and a chair back was actually a picture frame. Appearances are deceiving in a mirror world. Sprayed ants coming thru A/C. Printed Jabberwocky poem in Medusa font on white titanium. Sprayed it with fixative. Peeled Jabberwocky poem from glass and applied it to canvas back of portrait. Signed back of portrait with a Sharpie. In Photoshop, played with color in doorway of Alicia Thru The Looking Glass image. Painted orange in doorway of Looking Glass. Painted doorway more orange in Looking Glass portrait. Painted orange doorway some more. Painted alizirin checks in area of doorway on Looking Glass. Gave head a swoop of cobalt under the chin. Mouse said Alicia looked too fat. Perhaps the cobalt will push back the fat? Added more colbalt under Alicia's chin in portrait. Obsessively, repainted squares in doorway. Painted more pink under portrait chin. Does not seem to have made much difference.